"Whether a swimming pool on South Mumbai's Backgarden has legal sanction or not isn't the important thing. What matters is that there should be proper public consultation in the regard. And, the interests of weaker segments should be safeguarded," feels DraftCraft founder Gajanan Khergamker. 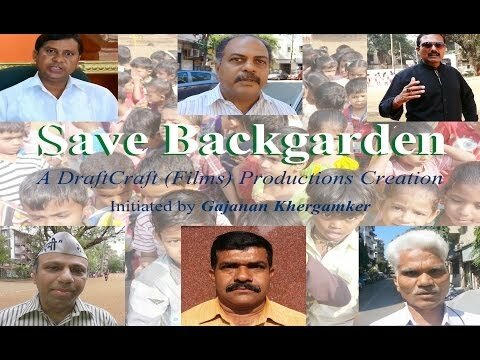 "'Save Backgarden' - A documentary produced by DraftCraft (Films) Productions - has been created only to put all the parties' perspectives in one place making it easier for anyone to understand the issue," he says. It has been initiated by Gajanan Khergamker - an independent editor, legal counsel and filmmaker - with over three decades of experience. DraftCraft fetches legal aid to the deprived through activism and legal intervention. The think tank provides a platform for the affected through campaigns aimed to agitate and advocate for the underdog. Public dissent over the construction of a swimming pool in South Mumbai's 'Backgarden' and resistance by a section of the locals, even direct beneficiaries, made it a key issue for DraftCraft.